A coffee shop owner has reported Waitrose to the Office of Fair Trading (OFT), claiming the supermarket's free drinks offer is damaging his business. Garry Sutherland runs the Gelateria Gazzeria in Meadow Lane, Buckingham, 20 yards (18m) from the supermarket. He said his coffee sales had fallen by 40% since Waitrose started giving free hot drinks to loyalty card-holders, and says the offer is "unfair trading". Waitrose said the promotion allowed it to compete against larger supermarkets. The supermarket's UK customers receive a free hot takeaway drink if they present a myWaitrose Card. 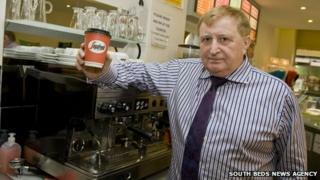 Mr Sutherland, who charges £2.05 for a regular and £2.45 for a large white coffee, said he had lost £200 of sales a week since the offer started, six weeks ago. "I don't mind competition with anyone on a level playing field, but free coffee is not a level playing field," he said. Using free coffee as a loss leader "amounts to aggressive marketing and unfair trading", he added. Mr Sutherland said he had not yet received a reply to his complaint to Waitrose's chief executive so had referred the matter to the OFT under Article 102 of the Competition Act. A Waitrose spokesman said its card was designed to help it compete against the major supermarket chains that are "very much bigger". "Instead of the standard loyalty card that typically gives 1% discount, we've chosen to give our loyal customers coffee, newspapers and other offers that are immediate, relevant and appreciated," he said. He added that the store made a "positive contribution to the Buckingham community". "We give £1,000 per month to good causes through our Community Matters green tokens scheme," he said. An OFT spokesman confirmed the organisation had received Mr Sutherland's complaint.